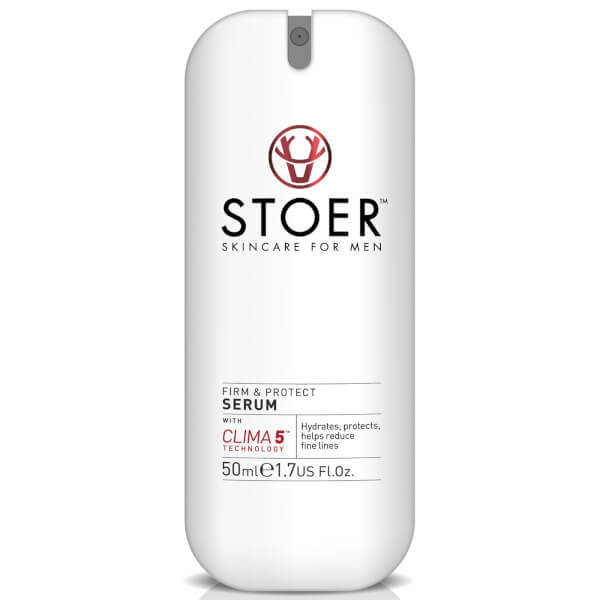 Catering specifically for men, the Stoer Skincare Firm and Protect Serum utilises innovative 'Cosmetic Drone' technology to infuse moisture and hydration deep into the skin. 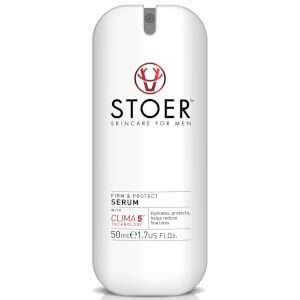 Powered by the brand's signature Clima5™ blend of five plant actives from four very different, individually challenging climates, the fast-absorbing formula promotes a smoother, firmer complexion without greasy residue. Minimises the appearance of fine lines and delivers a long-lasting matte finish. Free from alcohol, mineral oil, silicone, parabens and phthalates. Apply 1-2 pumps to fingertips and apply evenly over the face and neck, avoiding the eye area. For best results use morning and night. Can be used on its own or beneath moisturiser. Aqua (Water), Butyrospermum Parkii Oil, Propanediol, Glycerin, Butyrospermum Parkii (Shea) Butter, Octyldodecanol, Cetearyl Olivate, Phenoxyethanol, Sorbitan Olivate, Butylene Glycol, Citronellyl Methylcrotonate, Parfum (Fragrance), Ribes Nigrum (Blackcurrant) Seed Oil, Undaria Pinnatifida Cell Culture Extract, Helianthus Annuus (Sunflower) Seed Oil, Isomalt, Xanthan Gum, Caprylyl Glycol, Sclerotium Gum, Benzoic Acid, Inulin Lauryl Carbamate, Ethylhexylglycerin, Helianthus Annuus (Sunflower) Seed Oil Unsaponifiables, Dehydroacetic Acid, Rosmarinus Officinalis (Rosemary) Leaf Extract, Sodium Hydroxide, Carbomer, Sodium Lactate, Phytic Acid, Opuntia Ficus-Indica Stem Extract, Polypodium Vulgare Root Extract, Cardiospermum Halicacabum Flower/Leaf/Vine Extract, Sodium Hyaluronate, Tocopherol, Polysorbate 20, Hydrolyzed Adansonia Digitata Extract, Glucose, Leuconostoc/Radish Root Ferment Filtrate, Cetraria Islandica Extract, Sphagnum Magellicanum Extract, Lecithin, Saponaria Pumila Callus Culture Extract, Carrageenan, Rosmarinus Officinalis (Rosemary) Leaf Oil, Glyceryl Caprylate, Lactic Acid/Glycolic Acid Copolymer, Citric Acid, Polyvinyl Alcohol, Phenylpropanol, Palmitoyl Oligopeptide, Palmitoyl Tetrapeptide-7, Copper Palmitoyl Heptapeptide-14, Heptapeptide-15 Palmitate.